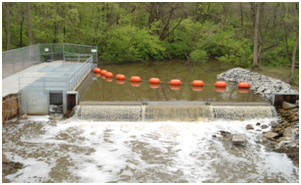 Project consisted of the Installation of a combination Sea Lamprey Trap/Fish Way on Trail Creek in Michigan City, Indiana. This work included a sheet pile wall across the creek to raise the water elevation, rip rap bank stabilization, cofferdam installation, construction of a concrete fishway/lamprey trap within the cofferdam, construction of an access road to the work site, and construction of access stairs for recreational users. Some of the challenges encountered during this project were completing the construction on the west bank of the river without access. Everything had to be staged and accessed from the east bank. Another challenge was working with multiple customers. This project was jointly funded by the US Army Corps of Engineers, the US Fish and Wildlife, the Great Lakes Fisheries Commission, and the Indiana Department of Natural Resources.